I have had this recipe marked with a post it note since December 2006. It comes from Martha Stewart's Holiday Everyday Food Collectible Cookie Edition. I am a total sucker for holiday issues of food magazines. And I really can't resist a cookie edition! A match made in heaven. Back when I got the magazine in 2006 I made 3 of the recipes which all turned out great and I marked 4 others to try. Now I can knock one off the list. Maybe in the next 4 years I can tackle one or two more. 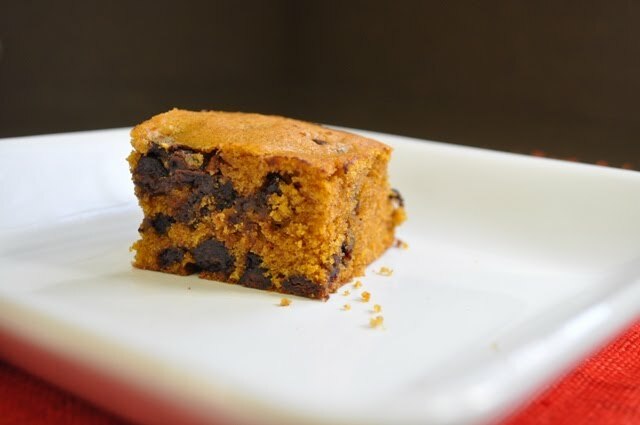 This recipe caught my eye because pumpkin and chocolate are two of my favorite ingredients and are a delicious when paired together in a baked treat. I was making another pumpkin treat today (subject of a future deluxe pumpkin post) and I had left over pumpkin...I immediately thought about this recipe. I only had enough pumpkin to do half of the recipe and it worked out to be the perfect amount for our 2 person household. These squares have a moist cakey texture and are rich with chocolate and spices that make your house smell deliciously like fall. 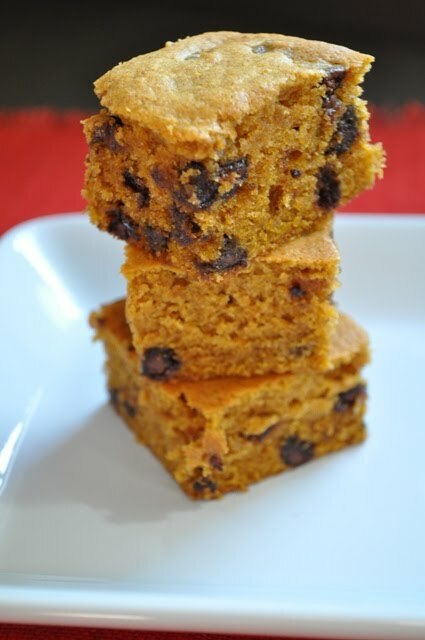 They are very reminiscent of the pumpkin bread recipe I make which is pretty darn yummy. And these pumpkin squares are pretty darn yummy too!